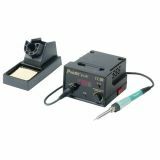 Mini soldering station pen-like style, SS-201, 160-330°C, 4-14 W, 110-220 VAC. The soldering station is intended for repair of mobile phones and PCBs, SMD - assembly and disassembly. It has a precision electronic temperature control that allows you to set the required temperature for the perfect brazing or desoldering of the tin wax used, without having to replace the beaker or the heater. The whistle of the flares station is iron-plated, and it can endure for a very long time in proper operation. shoe dimensions - overall dimensions - F14 x 200 mm.